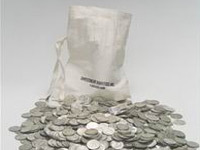 Due to the convenience of storage and the potential for easy liquidation, 90% U.S. Silver Coin Bags are one of the most popular options for Experienced Silver Investors. Also known as “junk silver bags”, these bags contain pre-1965 circulated U.S. Coins. Each bag contains either all dimes, quarters, or half dollars, at a face value of $1000. Bags are never mixed, and half bags are also available for shipment.